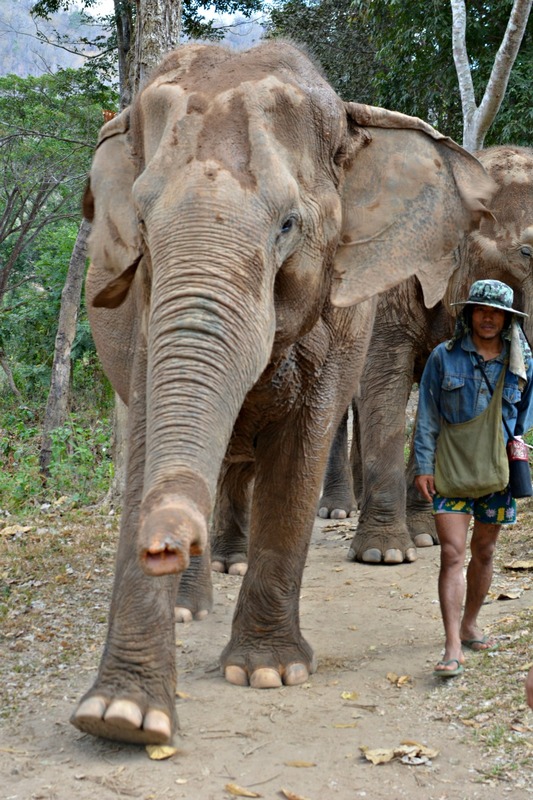 Walking with Elephants Through the Thai Jungle. A few years ago back in 2011 I blogged about my desire to work with Elephants and how it's always been a dream of mine. I wasn't very good at Biology or any of the sciences, so was unable to become a vet like I'd always wanted. 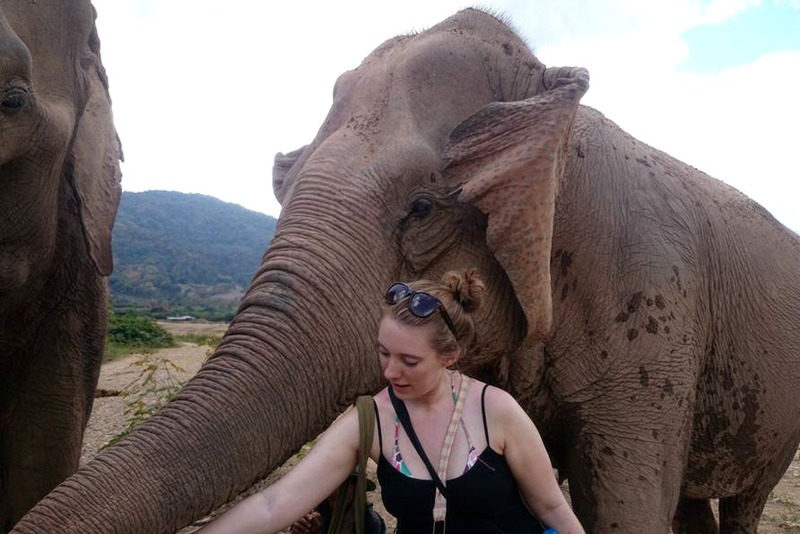 I vented my frustrations in that blog post and said how I would love to do a gap year after Uni and travel around Thailand and Borneo volunteering with Elephants and Orangutans. 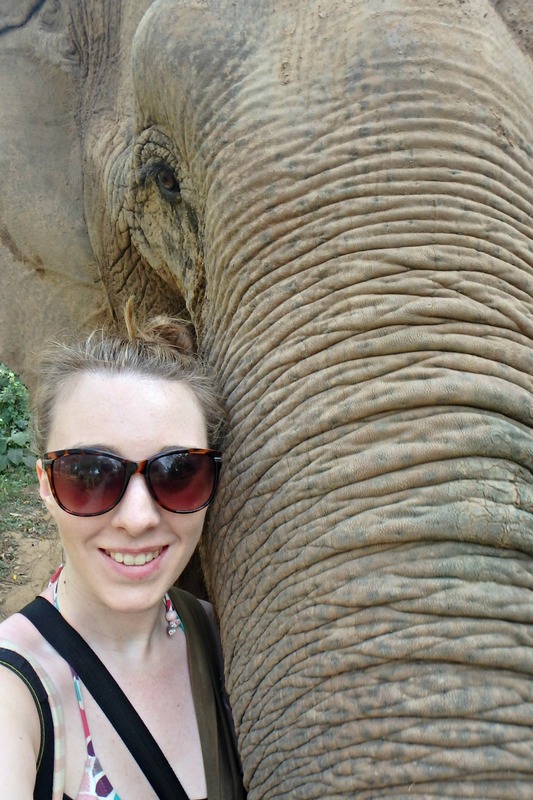 Obviously this didn't happen and instead I went straight into the work force...but while I was in Thailand I finally managed to tick visiting the Elephant Nature Park off my bucket list, and I also spent a day walking through the jungle with elephants. It was a dream come true. I feel like the past year or so I've realised that life is too short for regrets, and for constantly thinking 'I wish I'd done that'. I've been ticking things off my bucket list because I'm fed up with just dreaming about these things. 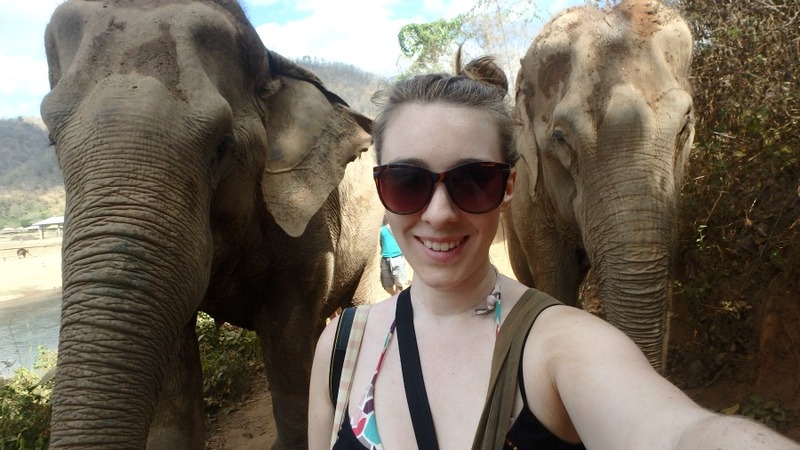 Last year I swam with sea turtles, and this year I've already walked with Elephants and am finally off to New York today. 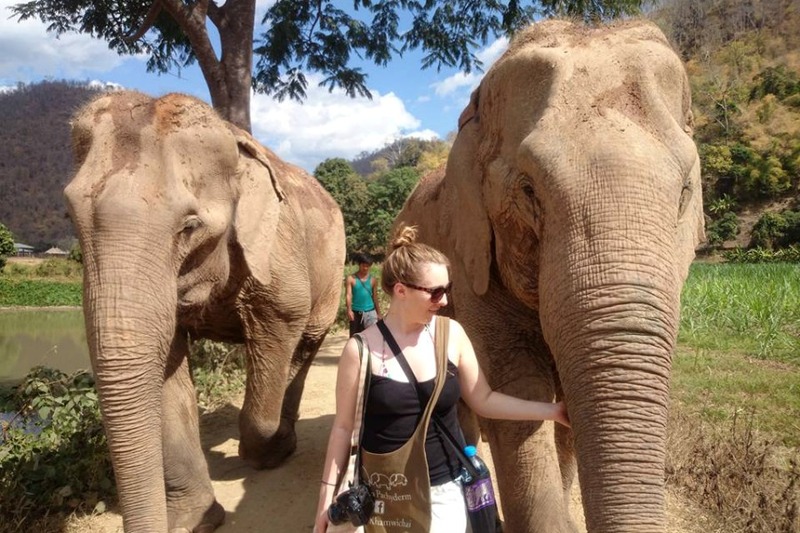 My sole purpose for going to Chiang Mai was for the elephants. It's the reason I only stayed two nights - so with my flight times I had a day exploring the city and a day with the elephants. I researched the elephants in-depth months beforehand. 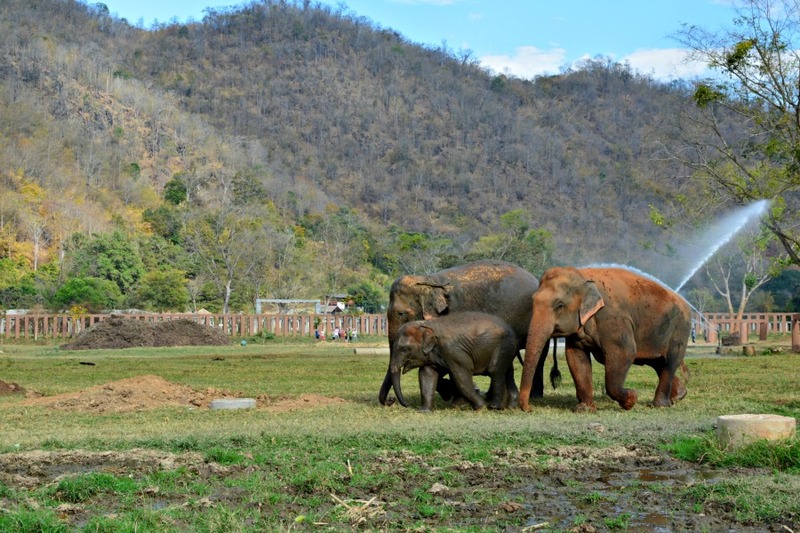 I knew I wanted to do one of the Elephant Nature Park experiences (I ended up choosing the Pamper a Pachyderm experience - keep reading to find out why) as they're the only sanctuary in Thailand who don't let you ride them. Riding elephants is a terrible thing. To make elephants do as humans say and allow people to ride them, they're taken from their mothers at a young age and put through a ritual called Phajaan, which means 'crush'. The ritual literally breaks their spirit and is a form of torture. They do this by isolating the baby elephant in a small dark space, starving them, and depriving them of sleep. They also beat them with bull hooks and other objects. Their spines are also not made to carry anything on their back, it's OK for maybe half an hour a day, but when they're carrying humans all day every day it can damage their spine and cause blisters which get easily infected (and left untreated). 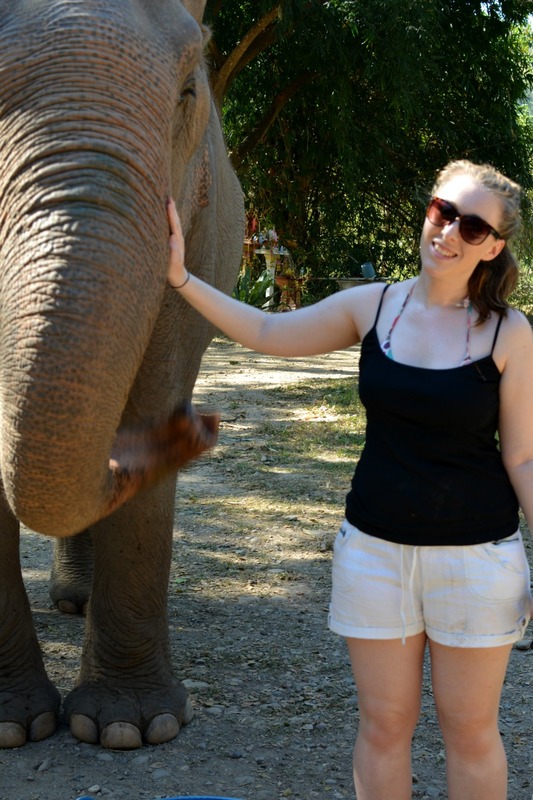 I chose the Pamper a Pachyderm experience, because after lots of research I figured it would be the best one for me. 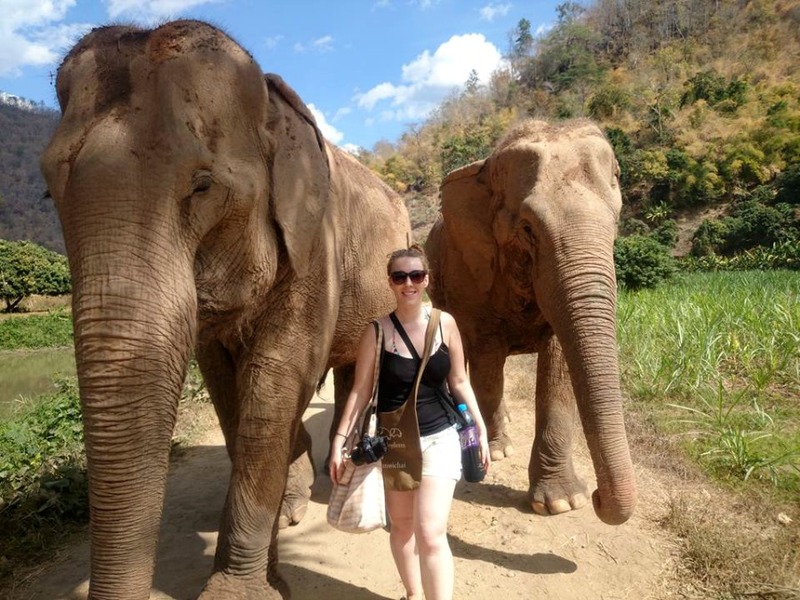 I wanted to spend as much time as possible with the elephants, have a really interactive experience, and I wanted to see some of the countryside. I didn't want to just go to the park and stand on a platform and feed them and look at them (as I saw in many blog posts about the ENP day trip). 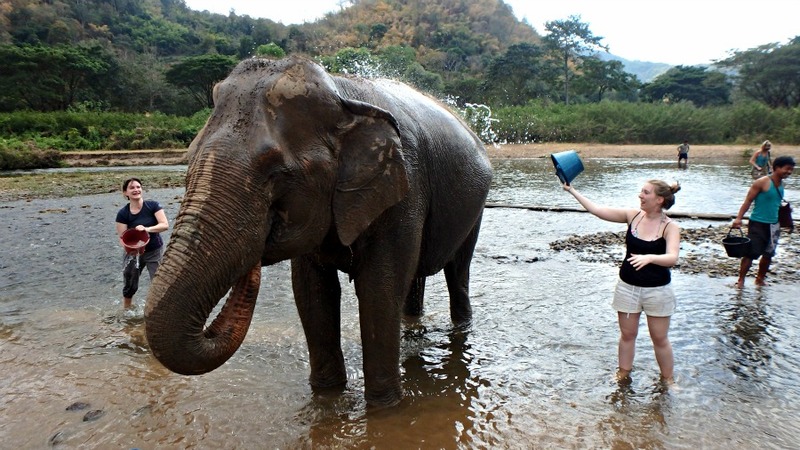 I wanted a truly interactive experience, and for me, Pamper a Pachyderm was the perfect choice. The van picked me up from my hotel, the Shangri-La, at around 8:45am, and as most of my fellow PP-ers were already on the van, we just had one more hotel to stop at to pick up one more couple. I had a really great group; two American couples on honeymoon, a Canadian solo travel woman, and an Italian couple who spoke little English so kept to themselves. We drove for about an hour through the countryside, watched a video on the history of the Elephant Nature Park, and stopped briefly for a toilet and snack break at a very modern and clean service station, and before we knew it we had arrived. The Pamper a Pachyderm day was honestly one of the most incredible experiences I've ever done. The elephant camp where the PP day starts used to be a riding camp, but the Elephant Nature Park persuaded them to try out their own concept of elephant care. 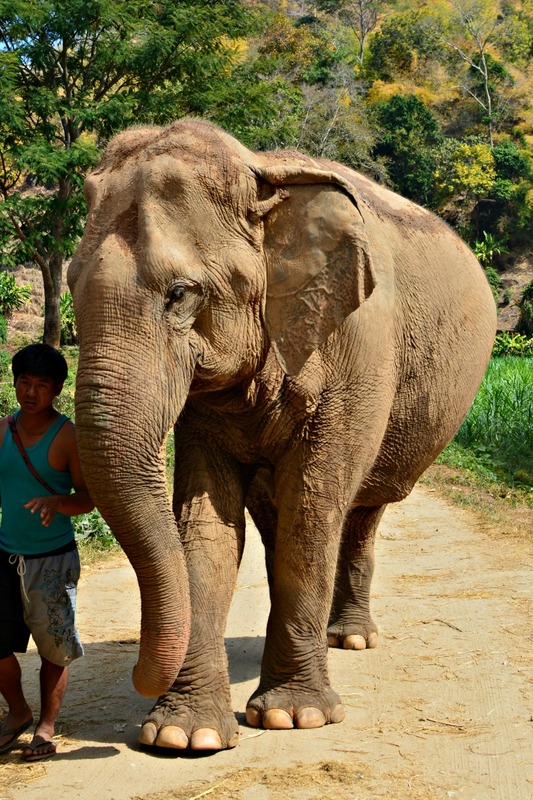 The mahouts no longer use bullhooks or cruelty, the elephants are no longer ridden, and the elephants get to experience love every single day. 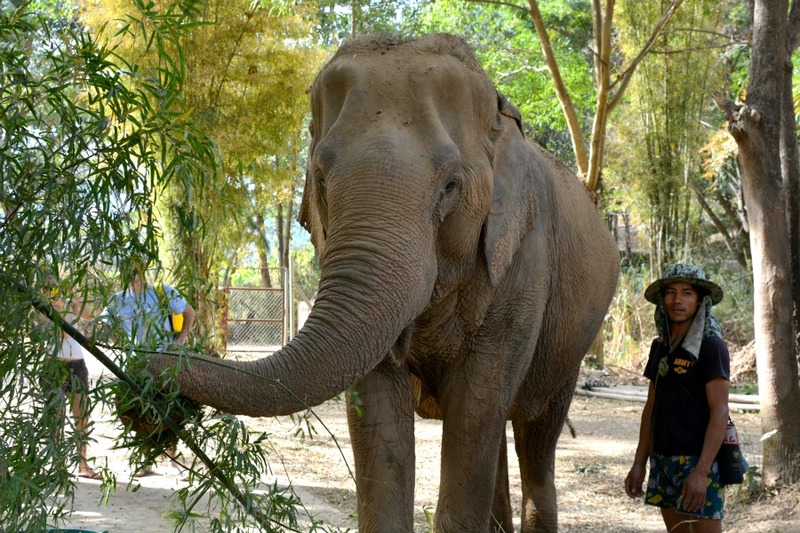 Every day a maximum of eight visitors are allowed to get up close to the elephants. We got to the park and started our day by being introduced to the elephants. We fed them huge buckets of watermelon, and immediately our hands got covered in muddy water as the elephants wrapped their trunks around our hands and arms to try and get the watermelon as quickly as possible. It was so surreal, and absolutely amazing. 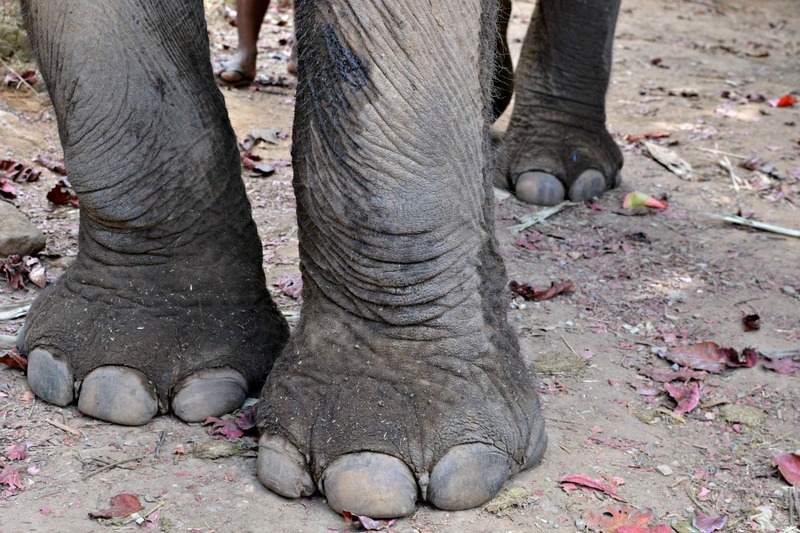 The elephants' skin feels really tough and hard, and all spiky from the short hair that covers their bodies. 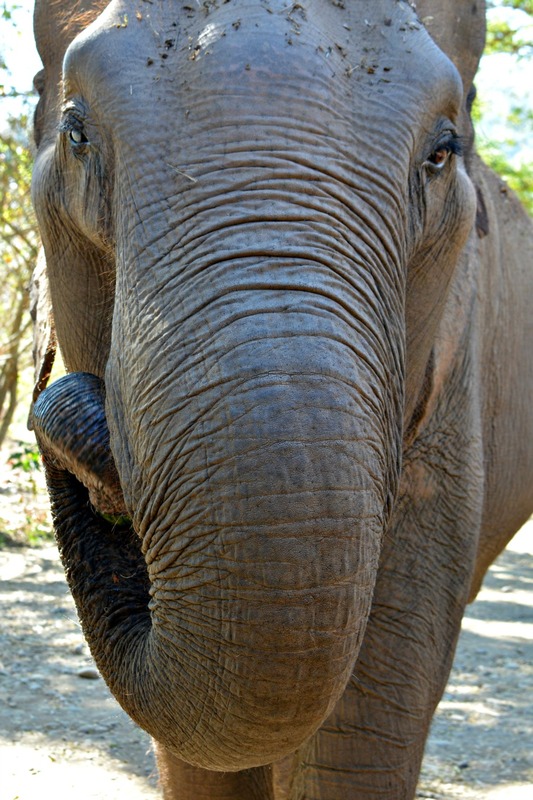 Their trunks are gentle as they snuffle at you for food, but there is so much power behind them when they want to use it - as I experienced when one of them decided I wasn't feeding him fast enough so pushed me aside with just his trunk so he could reach the food! 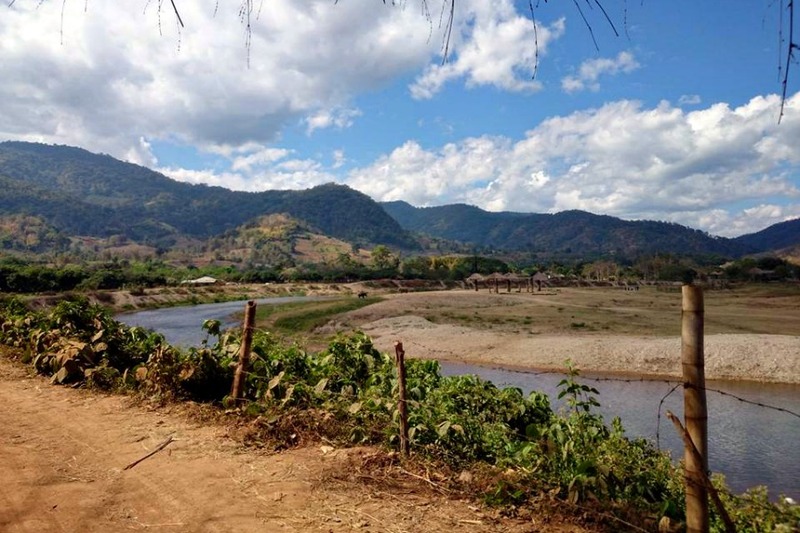 After finishing off a huge bucket of watermelon each, and collecting our liter water bottles and banana bags, we then walked the four elephants away from the park buildings and over to the wide open space beside the river. We stopped and fed them some bananas, then walked them through the river to the hilly side. I love their beardy lips/chins! 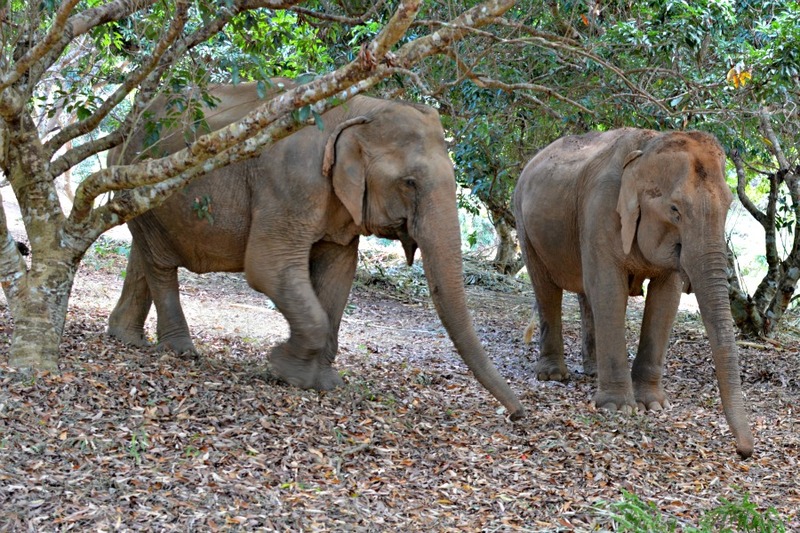 The elephants followed us and the bananas(! 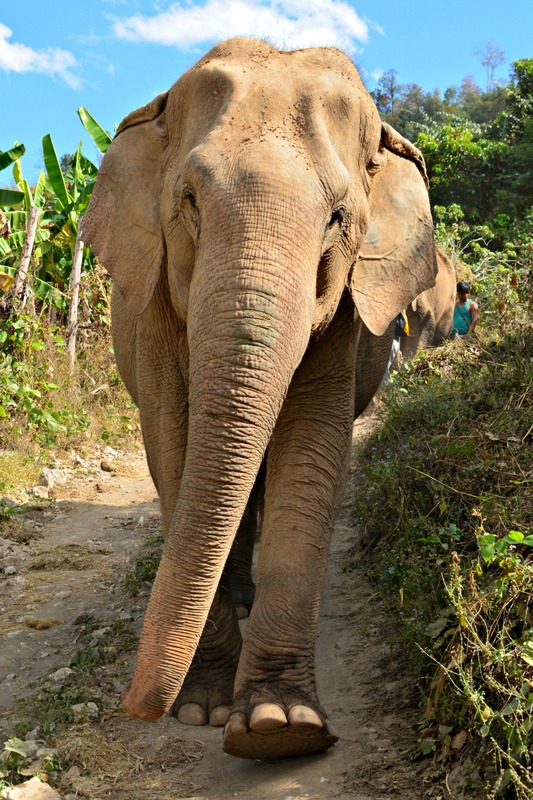 ), and every time we ran out of them the mahouts and our guide Nick would be there with more bags of bananas for us. 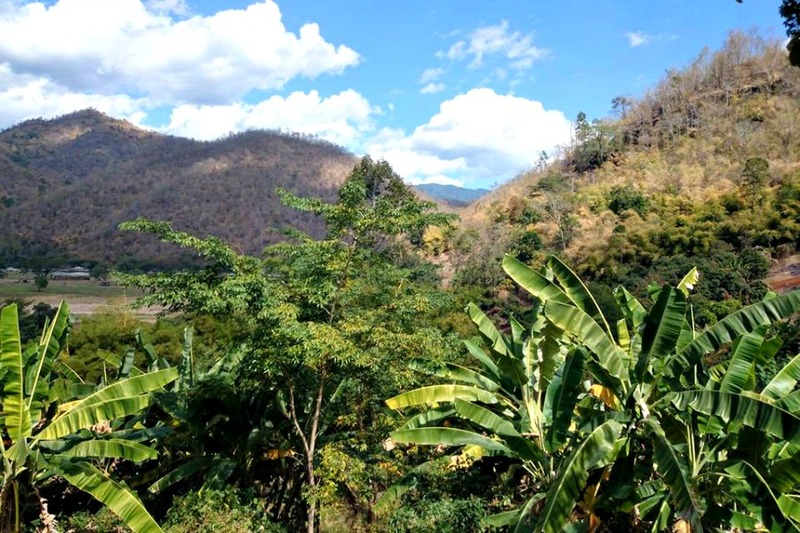 The countryside was just breathtaking, and I loved the opportunity to see such a different side of Thailand. 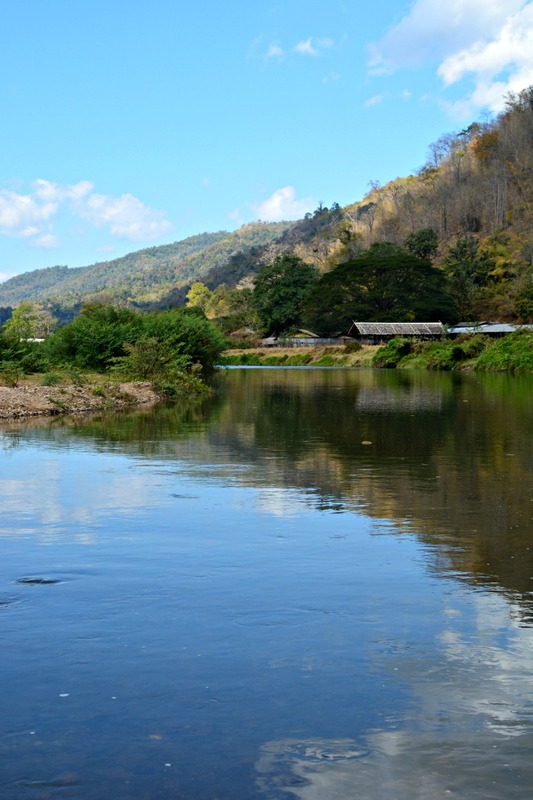 Chiang Mai really was just the complete opposite of Bangkok! 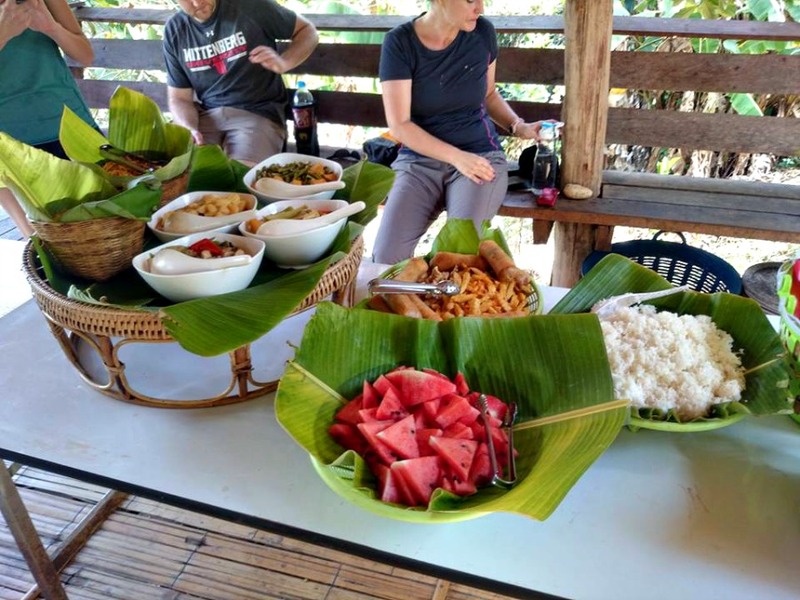 We walked for around an hour through the hills and jungle, up to a lookout spot where a open-air hut was set up for lunch. The elephants went off into the trees with their mahouts to have a rest, and we had an hour to refuel with an incredible spread! The food was delicious, and there was so much choice! 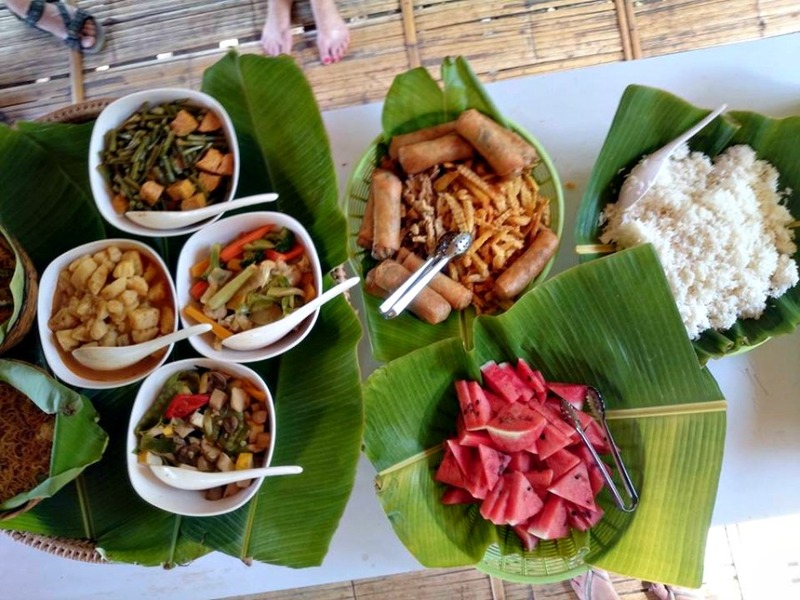 I particularly loved the huge spring rolls, delicious rice, curry, fresh fruit, plantain, and various other good stuff. Plus, check out the incredible view!! After lunch we we washed our hands again at the outside sink and used the toilet (a surprisingly clean little toilet block with loo roll and locks and everything), then went to meet the elephants again. We then led them back down the hill towards a different part of the river. 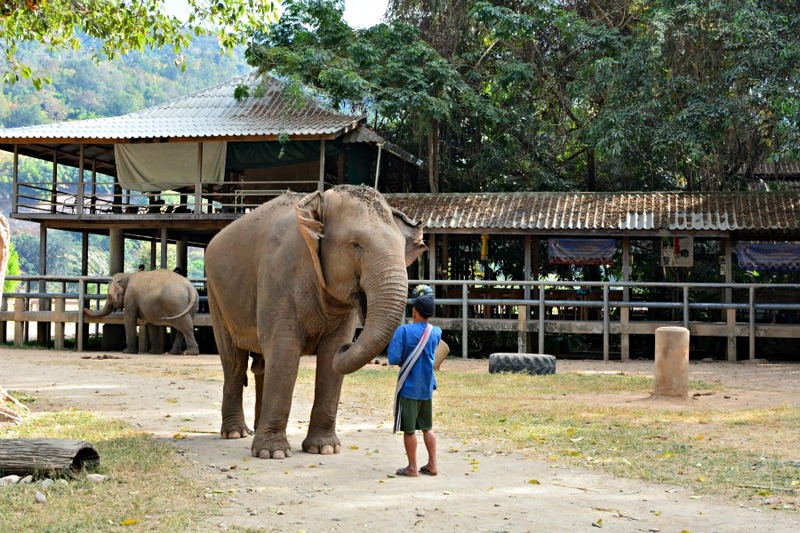 We passed an elephant camp teaching visitors how to climb onto an elephant, and my heart sank. I felt like crying, seeing those poor elephants being forced to give rides, so I gave my elephant a hug. It felt really good being able to give elephants hugs. We were walking by the river and one of the elephants got really nervy and started stamping the ground, which is apparently a warning sign. Apparently the elephant has really bad tummy issues and gets awful constipation which distresses her, so her mahout took her off to one side and calmed her down. When Nick the guide was taking this photo of me, I ran out of bananas in my hands and because I was trying to pose for the photo couldn't get any more out of my bag. So the elephant took matters into his own hands and pushed me with his trunk and then wound it round me to get into my banana bag! Cheeky! 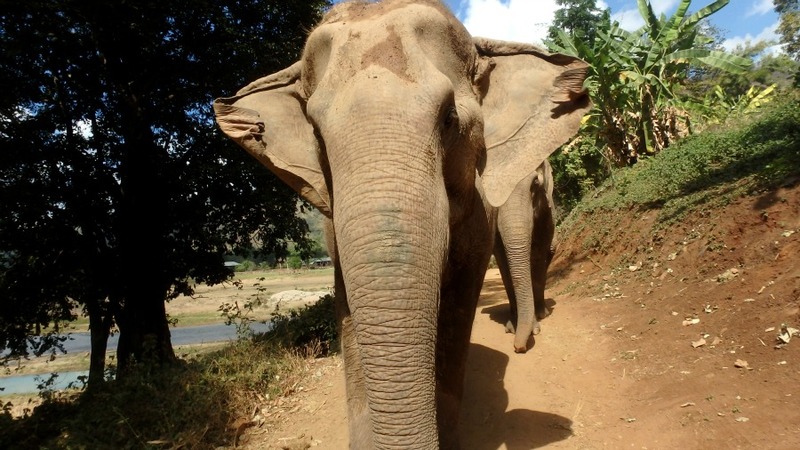 Those elephants love bananas, and when they're hungry nothing gets in their way! 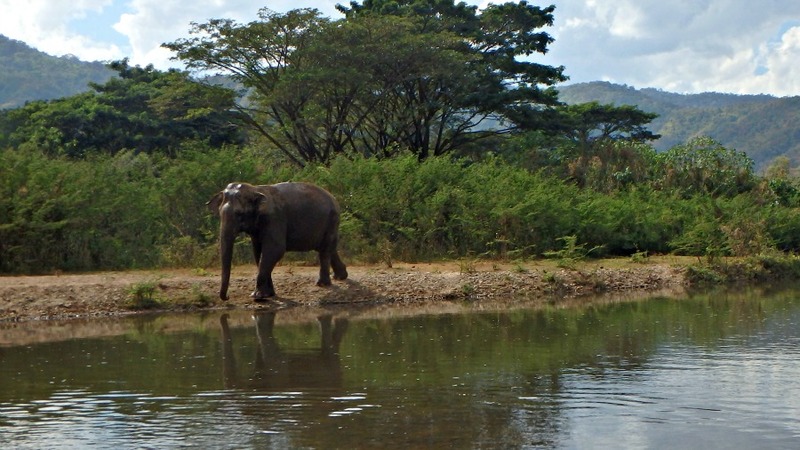 When we went across the river the three other elephants stood and started splashing with water with their trunks and ate some more watermelons, while we threw water all over their backs to get them nice and wet. 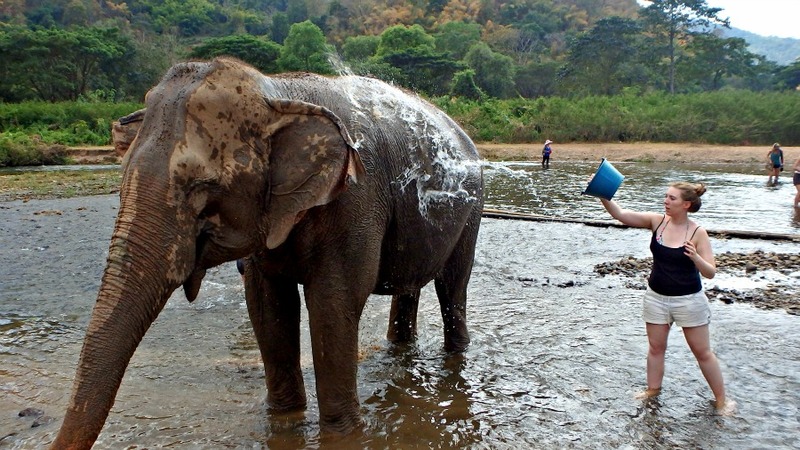 I LOVE the look on this Elephant's face as we throw water on him - he looks so happy!! 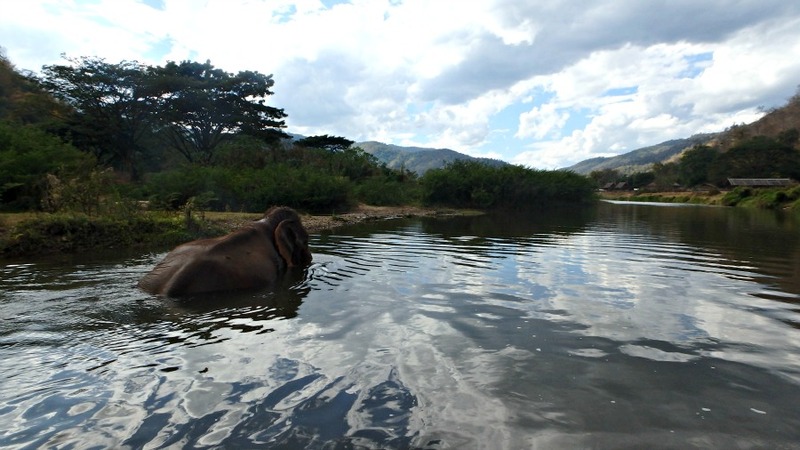 The poor elephant with tummy troubles went off by herself and sat in the water while her mahout comforted her. That was the great thing about this day, knowing that you're just spoiling and loving on these huge beautiful creatures that have been through so much hurt and trauma. Helping them to enjoy their freedom and just being patient with them and going at their pace. 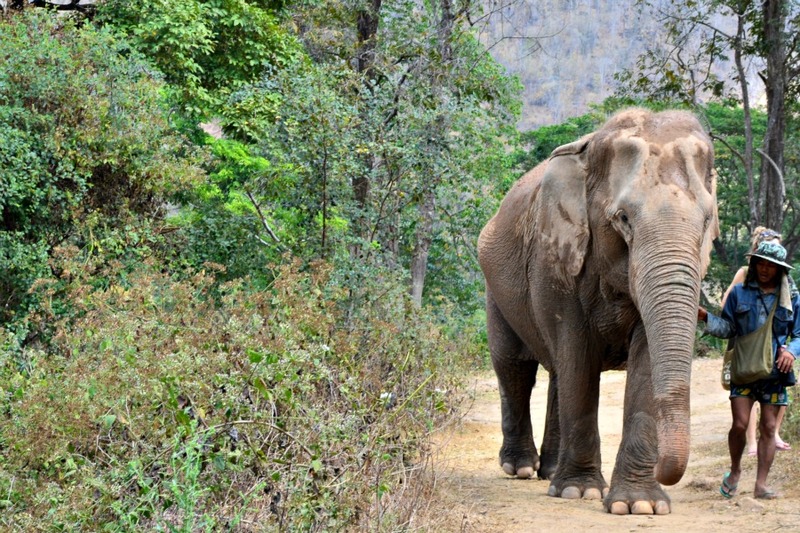 One of the elephants with us used to be used for logging, she was forced to continue logging even when she was pregnant, and because of this she lost her baby. She was trekking up a hill with a load of logs, when her baby literally fell out of her and rolled down the hill. 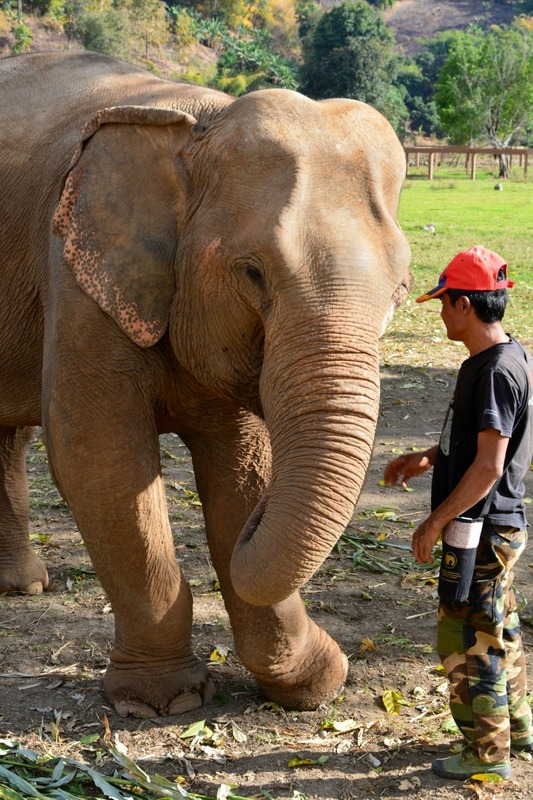 Her old mahout used his bullhook to force her to continue working and leave the baby behind. 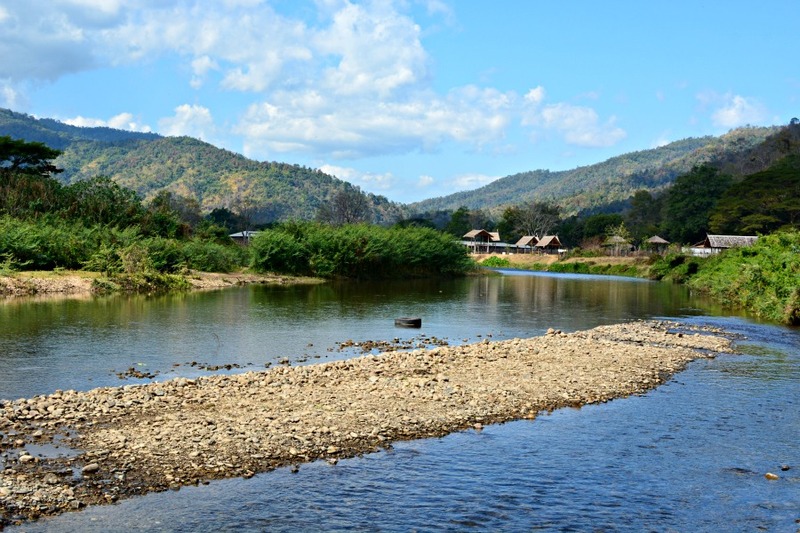 The river levels were really low so we headed back to the elephant camp by foot rather than the river raft as originally planned, the elephants following us and their trunks snuffling all over us searching for food. When we got back they started throwing dirt and sand all over their backs, and one of them grabbed a huge tree with it's trunk and pulled it down so it could eat the leaves! 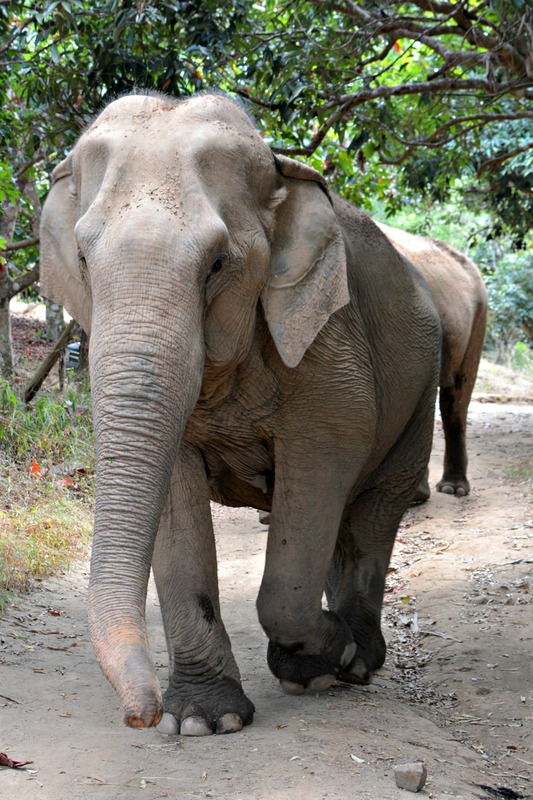 We said goodbye to the elephants, then climbed back into the van to head to the Elephant Nature Park. 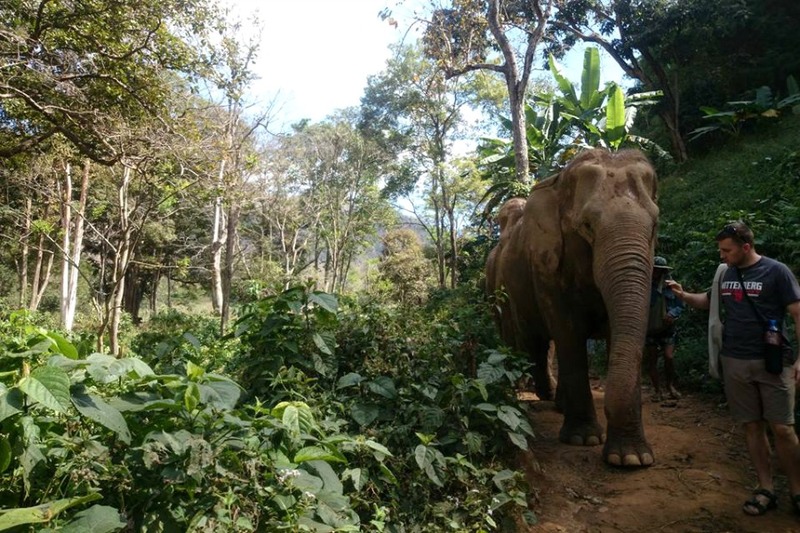 We were shown around the park, and introduced to a new arrival who had arrived that day; a very old elephant who had been rescued. 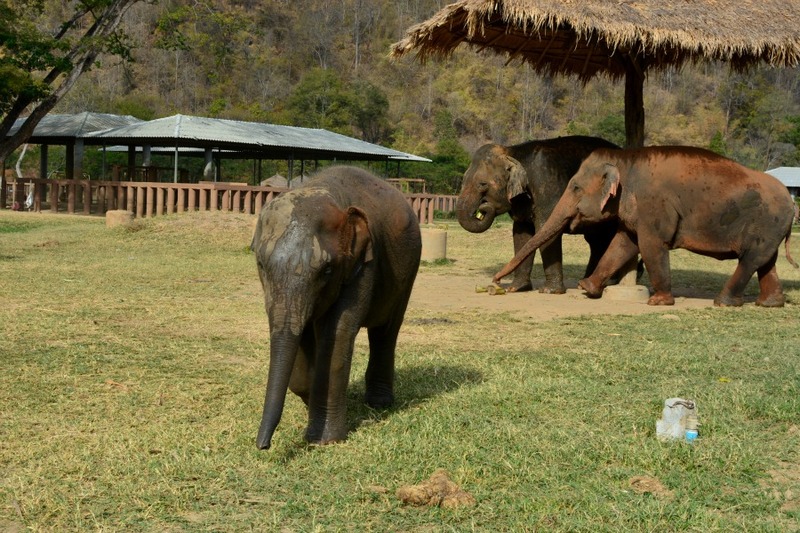 We then went to see some of the other elephants who live at Elephant Nature Park, and got chased by a two year old baby elephant! Apparently they just want to play, but don't realise their own strength, so you have to run away from them because otherwise they can seriously hurt you at that age. As soon as he came running towards us wanting to play the mahouts sprung into action and herded him away like a sheep, it made all of us laugh a lot though! This elephant was injured badly by a car. He was a street elephant who was used for begging, and a car crashed into him, damaging his leg. He now can't stand on it properly. 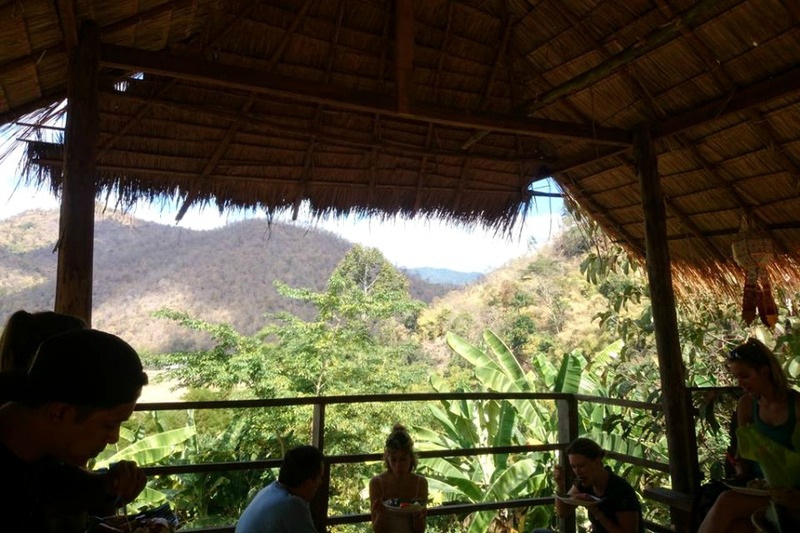 We then went up to the main Elephant Nature Park building and had some snacks and drinks, before saying a final farewell to the Elephants and jumping back into the van and heading back to our hotels. I got back at around 6pm, and after getting showered and changed I went out to the night market again to finally get some street food! I had the most amazing 'Chiang Mai sausage', which everyone told me is famous in Thailand, as well as a freshly made Guava juice, and mango sticky rice (sticky rice, with coconut milk and mango - SO YUM). I then also got a banana Rotee (basically sweet Thai mini-pancakes). All of this came to the grand total of around £3. Bargain! And so so delicious. I didn't get any photos sadly, I was just too excited to eat it all. I then strolled back to my hotel and got an early night before my flight the next day. 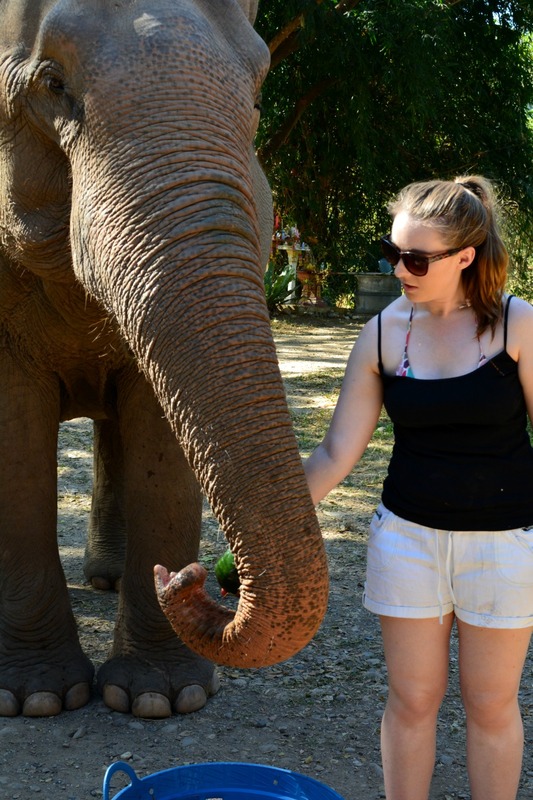 I honestly had the most incredible day on the Pamper a Pachyderm experience, and think it's well worth the money. 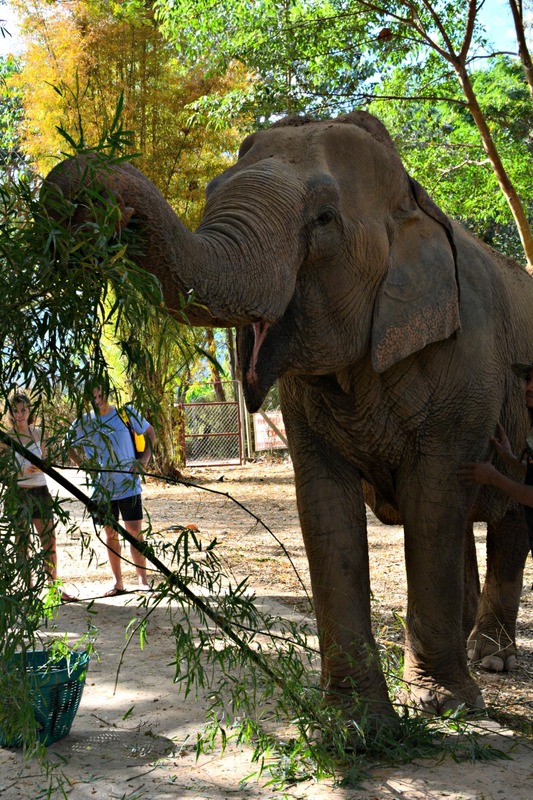 It only costs 6,000baht (£120), and all of that money goes towards the elephants care and food. I booked about 2 months in advance, and the experience is an adult-only one. 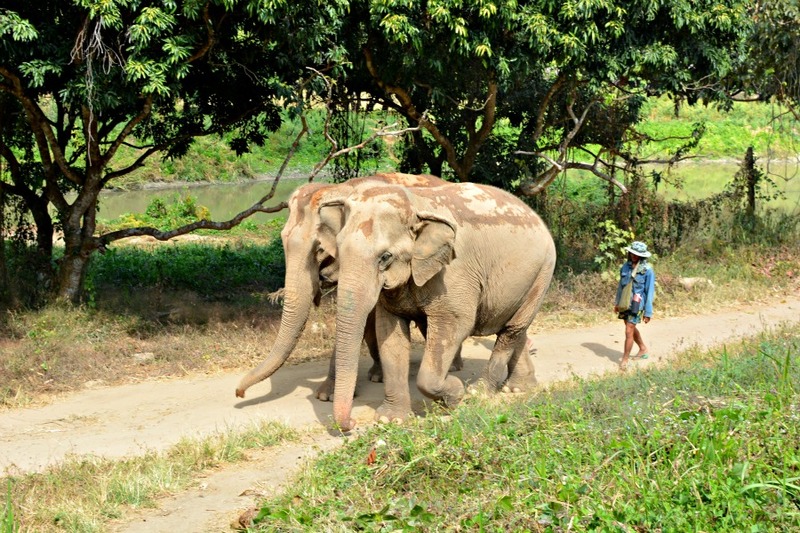 The amount of walking involved and closeness to the elephants really isn't suitable for kids. I took with me; a large cross-body day bag (a good ole Primark one that didn't matter if it got wet/destroyed), sunscreen, bug spray, hand sanitizer, tissues, wet wipes, flip flops (they advise you to bring trainers but you really don't need them), change of clothing in-case you get wet during the river bathing, money/purse, and of course my phone and cameras! They give you a huge liter bottle of water, so no need to bring that with you. I would definitely do the experience again, and to be honest if I go back to Thailand I'd probably make the effort to fly to Chiang Mai just so I can (it's about an hour away from Bangkok, and flights are super cheap). 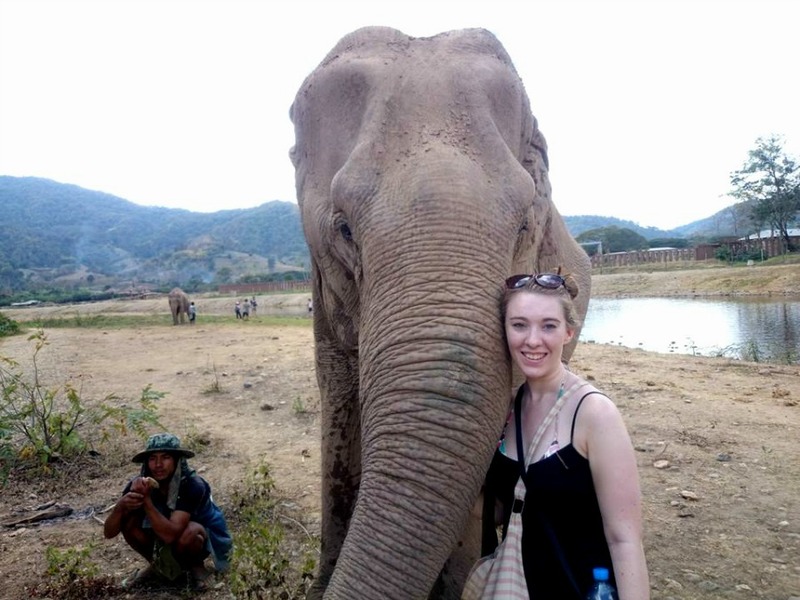 I have my eye on the 7-day volunteering programme and the 1-day Karen Elephant Experience! The main thing to think about before signing up to do any sort of activity like this is to think long and hard; would you do this if you weren't allowed to take photos? Are you doing this just to get photos, or because you want to show an animal your love and care for a day? For me, I would without a doubt go back and do it all over again even if I wasn't allowed to take photos. For me it was such an amazing experience to just have such a huge amount of interactive time with the elephants and show them a bit of love after everything they've been through, and to show them that humans aren't so bad. Check out my vlog below to see more of my incredible experience! 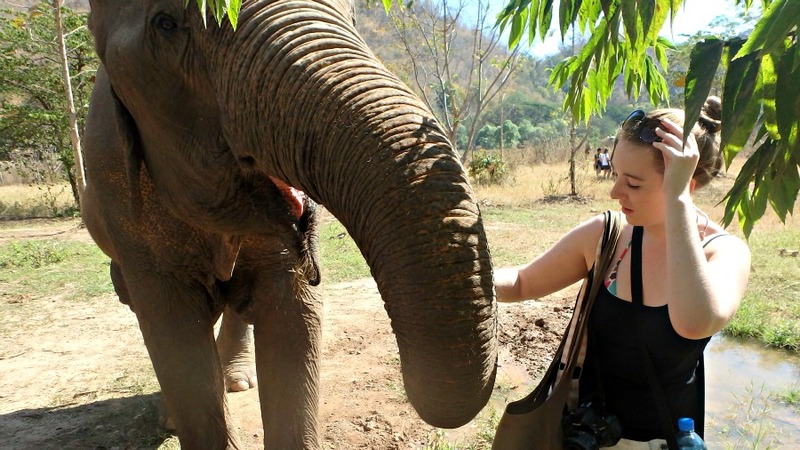 Have you ever got up close with elephants or been to the Elephant Nature Park? Ohhh lux! I've been waiting for this post for so long, I'm so so happy you went to such an elephant friendly experience and got to live your dream of meeting some of these beautiful animals face to face. 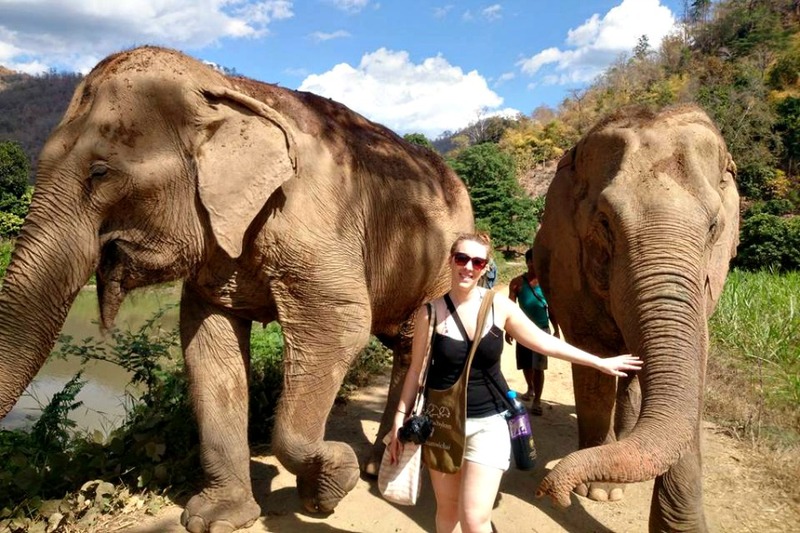 I'd heard that it is really bad to ride an elephant and I'm so glad that you've reviewed an alternative which hopefully lots of people visiting Thailand will choose to do instead. Oh wow what an amazing dream to finally have true. I'm so glad those elephants got they love the really deserve. I love the picture of his happy face when you threw water over him! This sounds like an amazing experience! I'm genuinely so jealous that you got the chance to get so close to these beautiful creatures. I have heard so many stories about people riding elephants and it's not pleasant, so you definitely picked the right choice. I'm going to make a trip there when I get around to visiting Thailand. So amazing that you got to live out your dream in such a wonderful and safe place. 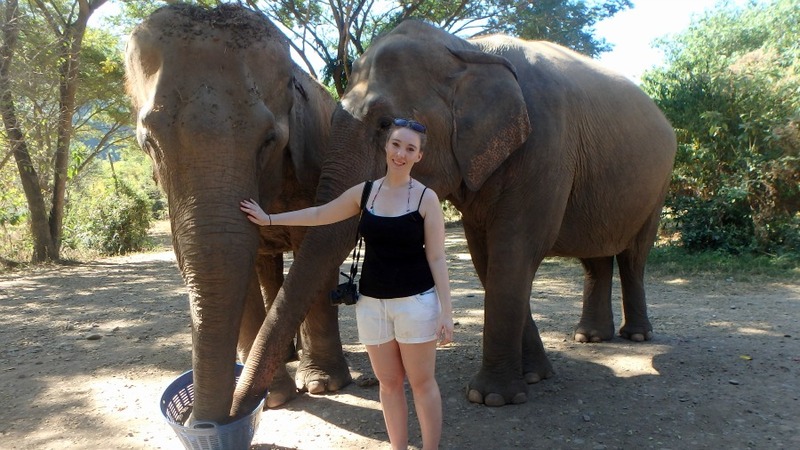 Ohhh I love elephants and I can't believe how up close and personal you were able to get with them here! I think it's so important that you mentioned the ethics around their care, not riding them etc. Tourists are so oblivious to these things. You look so happy in the photos!!! What a lovely post! 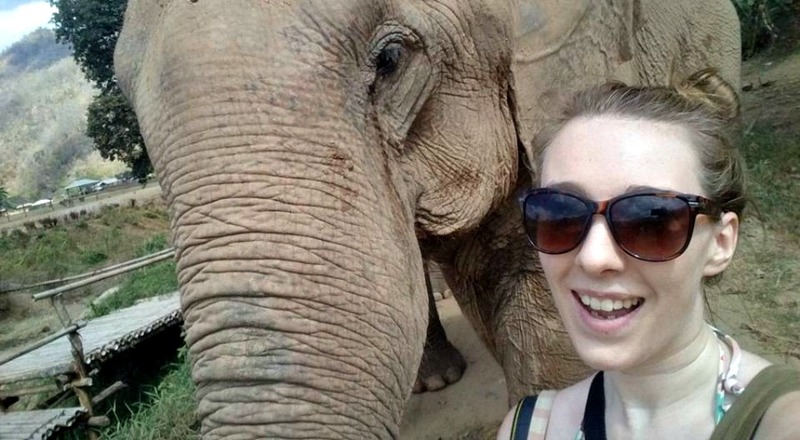 I have to confess, I was a little worried when I first read the title, but it was a relief to hear that you actively sought out elephant-friendly experiences! This broke my heart - and genuinely brought tears to my eyes - why do humans treat these gentle giants so badly? (Not this company I mean). Oh, beautiful! A friend of mine volunteered here long-term and it is a place I really, really want to get to. Your photos are beautiful. So glad you had such a wonderful day there. Oh wow, what an incredible experience. It's so great to see an alternative to riding them as well. This looks amazing!!! Gosh I am so ignorant, I never realised riding elephants was bad, I guess I never thought about it because it seems logical. Such a great alternative. That grinning elephant getting water thrown over him is the best thing ever. LOVE.